Fibroids are very common in infertile women. Most are intramural fibroids , which are present in the wall of the uterus) , and these do not need to be removed prior to IVF, as they do not affect embryo implantation. You can read more about this at http://www.drmalpani.com/fibroids-and-infertility.htm. 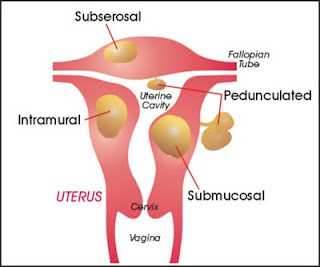 It is only submucous fibroids ( those which are in the uterine cavity) need to be removed. These can be best removed with an operative hysteroscopy. Unfortunately, most doctors have itchy fingers and are happy to operate at the drop of a hat. 6. Gynecologists are trained to operate - and are very happy to do so ! This is far more profitable than reassuring the patient or advising watchful waiting ! Many will justify their advise for surgery by saying - If I do not operate, then someone else will, so I might as well do the surgery myself ! 7. The surgery involved is a " simple " laparoscopy. which does not need the doctor to ut open the belly. This is "minor surgery" , which is done on a day-care basis, so why not just fix the problem since the solution is so simple ! In fact, many gynecologists actually end up scaring patients into saying yes for surgery. They take advantage of the patient's ignorance, and trot out a large ( and very creative list !) of reasons for why surgery is the best solution for them. This includes the following reasons, none of which are the unalloyed truth. The advise seems to be - removing the fibroid may not help your fertility, but it's still a good idea to do so, because some fibroids can cause problems during pregnancy, so why take a chance ? Most infertile women are very emotionally vulnerable, and are happy to do everything they can to prevent problems during their much-awaited pregnancy. This is why many happily sign up for "preventive surgery" - without reaslising the risk they are running ! This is such a fantastic and informative blog. I have to give my regards to you and I think more doctors should communicate this way. I was happy to read about fibroids as it is been affecting me. I am 27 years and first found out about it while I was 24. I had 2 intramural fibroids then which were around average dia of 3 and 8 cm each. It was shocking to discover it then. I had absolutely no symptoms. But over the last year i could feel a definite bulge on my stomach. Now i find that the 3 cm fibroid has become 11 cm and the other has just become 9 cm. Even though my doctor here in delhi had at that time advised me to wait and watch. She has asked me to consider myomectomy. I still have no major complaints other than little discomfort. Both these fibroids are still not said to affect any organ acc to my CT. I am single still and not likely to be married for the next 1.5 years.